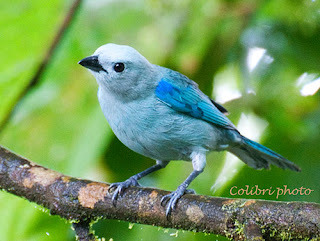 The Blue-gray Tanager is probably one of the most commonly seen and easily recognized birds of the Andes foothills in Ecuador, whether it is the western or eastern slope. It can be observed foraging in trees and gardens and predominates the activity at many fruit feeders. It is a ubiquitous passerine with a pleasant personality and a charming grace. This is one of those birds that you can tire of seeing because of its simple colors and constant presence. Although it has a strikingly beautiful bluish gray hue, it is not as stunningly marked as other tanagers that frequent the area. One has to get over the unpretentiousness of it appearance and appreciate its classic allure. In the Mindo valley the Blue-gray Tanager can be seen nervously gleaning the fruit trees in search of berries and other suitable morsels. But they are particularly susceptible to the siren’s call of the fruit feeders at Milpe Bird Sanctuary and Mirador Rio Blanco. Here you can see them dominating the various species as they forage for some delectable offerings. It is also quite common in the gardens of Hacienda San Vicente in the town of Mindo. On the eastern slopes the Blue-gray Tanager can be observed along the Loreto and Archidona Roads, traveling from Baeza to Tena. In Misahualli they can be seen frolicking in the trees along with various Squirrel Monkeys that inhabit the park in the center of town. I find the white coverlets of the eastern species of Blue-gray Tanager to give them a more striking appearance that the western race. 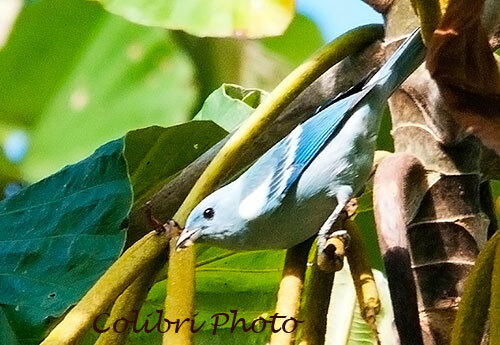 For more detailed information on the Blue-gray Tanager go to my HubPages article here. Also see blog articles on Hacienda San Vicente, and Milpe Bird Sanctuary for locations to observe this beautiful species.